As we kick off the new year, we want to prepare our hearts for all God is going to do in our church this next year. We believe that prayer always precedes a mighty move of God, so starting this Sunday, January 13th, we will begin our 21 days of prayer and fasting, as we seek God's will for our church, city, nation, and world. Download a digital copy of our prayer booklet here. * Join us as we come together as a church via Facebook Live for prayer led by a staff member. Access via the Crossbridge Facebook page or click here. Detoxes are popular today from 21-day no carb detoxes to 1-month juice detoxes to get our bodies healthy, especially after the holiday season. While taking care of our bodies is great and needed, what about our souls? What if we got intentional about getting the gunk out of our souls that causes distance from God, disturbance in our relationships and distractions from our purpose in life? CALLING ALL VOLUNTEERS.....We are coming up on the one year anniversary of UNFINISHED! We want to CELEBRATE all that God has been doing, give updates on where we are and look ahead to where we believe God is taking us! 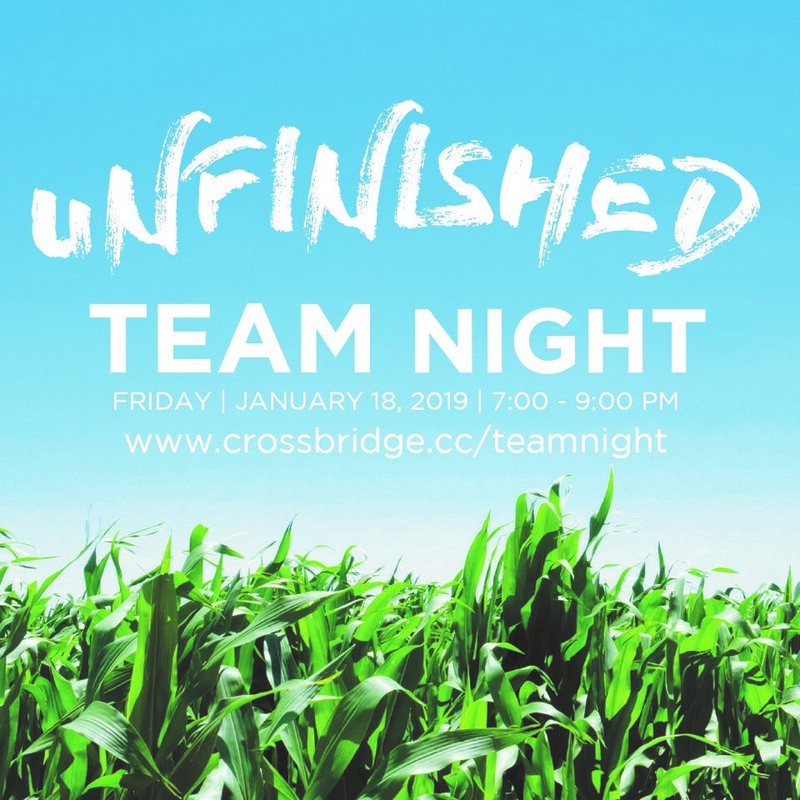 We want every leader and volunteer to join us for one massive TEAM NIGHT! We will have plenty of food, music, fun and surprises. Spouses are invited and childcare is provided from Birth thru 6th grade. Childcare reimbursements will also be available. Please RSVP HERE to reserve childcare and help us gather a headcount for food. Join us for a Night of Worship & Prayer on Wednesday, January 30th from 7:00-8:00PM. You don't want to miss this powerful night! Childcare is available for 4th Grade and younger. Click HERE to register. God has been gracious to us in 2018 at Crossbridge Church, and He has used your generosity to help make growing followers of Jesus. As 2018 ends, can we ask you to pray and ask God what you might give this season as we look to expand His Kingdom through our new building on Harlem Road that will further our mission of making growing followers of Jesus Christ in Fort Bend County? We will not have any services Sunday, December 30th. Join us as we kick off 2019 with a brand-new series "DETOX" as services resume Sunday, January 6th at 8:30, 10:00 & 11:30 AM. We are days away from “Christmas in Fort Bend”. Here are a few things to know! If we are “sold out” of a service you are attending (at this writing that's 3 of them! ), remember we have some buffer seats so don’t let that stop you from inviting and bringing someone! Remember, we will not be having our regular three morning services on the 23rd! First service is at 4:00 p.m.! We are expecting a TON of guests this weekend, so this is your friendly pastoral reminder that we are all on the “Welcome Team”. While we have an awesome Guest Services Team, it is a privilege and responsibility for all of us to show Christ to everyone that is coming with our smiles and attitudes. So, come joyful and expectant that God is going to move! Please bring your tickets with you! This helps us know how our system is working and highlights any improvements we can make for the future! PRAY! Will you ask God right now that everyone who comes to Crossbridge for Christmas in Fort Bend would have a fresh encounter with Him? Pray that His hand is on everything from our lobby photo booths to our production, worship, guest services and kids teams; and please pray for me, that God would take my feeble words, energize them by His Spirit and do something we can’t imagine. I am so proud of all the inviting you guys are doing! Keep it up! See-ya at Christmas in Fort Bend! Don’t let the stress of Christmas be your family’s final word this holiday. Find some peace and hope instead. Join us for Christmas in Fort Bend presented by Crossbridge Church... awesome music, a touching message, and memories you'll never forget. If you’re wondering if you’re invited, you are. And, of course, invite your family and friends, too. Click here to get your free tickets. Crossbridge is GOING to El Salvador to work with Shalom Children’s Home. This is a great opportunity to take your next step in living on Mission by taking the GOOD NEWS of Jesus to the nations. Deadline is December 31, 2018. For more information and to register, please visit crossbridge.cc/elsalvador. One of the most common questions asked during this season is “What are you doing for Christmas?” It’s a good question to show that you are interested in others’ lives, where they are going and what they are doing. What can happen during this season is that’s all we do is “do Christmas”. We shop, we go to parties, family gatherings, trips, and give our kids great experiences. No wonder the news report I saw this week said 88% of people feel stressed out during the holidays. Now to be fair, none of those things are bad and many are fun and awesome. What can happen is we “do Christmas” and forget why Christ came in the first place. Christ entered our world, so He could do all that is necessary for us to be pleasing to God through His life, death and resurrection. Christ was changing our relationship with God so that it would not be about what we “do” for God, but about what Christ has “done” for us! Friends, let us not lose the “done” work of Christ, as we “do Christmas”! I don’t think the answer is to stop celebrating Christmas, but rather to adjust some things. Instead of asking the question “What are we doing for Christmas?”, what if we asked, “How are we going to LIVE Christmas? How are we going to live out and celebrate the great news of Christ coming into the world?” These questions might lead you to slow down a little this season. I mean, do we have to go to EVERY Christmas party? Do we have to go to EVERY light event in the city of Houston? What if we created some space and practices to really focus on the coming of Christ? You can still wear the ugly sweater, watch Elf once a week and wonder what “figgy pudding” is; but in the middle of all that, do some intentional things to cause you and your family to focus on living out the reality that Christ has come and changed everything! Perhaps serve a neighbor in some way, read a good Advent devotional or read through a gospel in your New Testament. Our annual Christmas Eve services where we invite everyone we know to join us in celebrating Christ coming into the world. Since the coming of Christ is “good news of great joy for all the people” we use these services to invite “all the people”. You still have time to invite friends and family to celebrate Christmas with us! We’ll have treats and photo ops in the lobby, a short inspiring message, lots of GREAT MUSIC and childcare too (Birth -6th Grade)! Send that e-mail or text, make the call, walk across the street or hall and invite that person to experience Christ this Christmas. For about two decades Kathleen and I have given above and beyond our normal giving at this time of year. There is something about giving that gets my, and I pray my family’s, focus off just buying gifts. It reminds us that God GAVE Christ for us and that is our life and model for living. Giving generously is a great way to “LIVE Christmas” and not just “do Christmas!” Crossbridge is seeking to make the biggest impact with the gospel we can, and our giving adds fuel to our fire for living on mission. You can go here to give this season. I pray you will have the most joyful, fun, life-giving, peaceful, loving, memorable Christmas ever this year! That this won’t just be another year of “doing Christmas,” but you would actually “LIVE Christmas” this year. I love you Crossbridge! See-ya Sunday! P.S. I’ve been loving our “CAROLS” series this season. Wait till you see what our worship team has cooked up for this week! It’s gonna be good! I’ll see you there.